Where we are and where we're going? Where to turn? Who to believe? How did it all end up this way? 2018 - OMG - I pulled this tune from the archives, gave it a listen and COULD NOT BELIEVE how much it is even more relevant today! I cleaned up the arrangement a bit and re-recorded it. The instrumental orchestral version (sans vocal) I thought was interesting and "worthy" enough on its own to be posted as well. Below is what I wrote as "liner notes" back in 2004 -- its freakin' scary isn't it? Lyric Details: "Post Nov. 2nd, 2004 angst... (election day-after blues)"
Troubled by the increasingly aggressive stance America has taken in the world today, I have felt helpless as major news channel coverage seems to be reduced to love-em-or-leave-em patriotic sound bytes and shouting matches by the schoolyard bully type. An isolationist smug superiority has permeated the rhetoric of American politics--and sadly, the American public has followed in lock-step, gleefully agreeing to ever-greater degrees of intolerance and scapegoating. Spiritually despondent after Nov. 2nd, 2004, these lyrics were a catharsis in an attempt to find solace and strength against the drudge and (mis)direction our country was pursuing -- the road ahead looked mighty bleak. Harmonically, the composition is an amalgamation of classical and modern jazz harmonies. It is structured using shifting stacks of open fifths and fourths implying vertical chord structures yet their primarily "linear-in-nature motion" predominates. 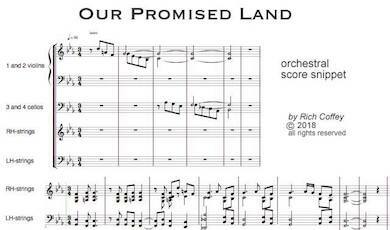 The orchestration was conceived as primarily a string chamber orchestra of strings with a bit of background accompaniment by electric bass and drums. The meter shifts between 3/4 and 4/4.